Sheringham TownOnce a small fishing community boasting - at its height - 200 boats whose catches of crab and lobster fed the fishmarkets of London, Sheringham became a prime holiday destination at the end of the 19th century with the arrival of the railway. This boom in the Victorian and Edwardian years is reflected in the town's architecture, combining fin de siècle styling with tradtional Norfolk flint. Indeed, the town boasts a Roman Catholic church designed by modern gothic master Sir Giles Gilbert Scott, architect of Battersea Power Station, Liverpool Cathedral and Bankside Power Station - now the Tate Modern gallery. The town is a home to the arts, and the 180-seat Sheringham Little Theatre boasts a summer repertory season (which celebrated its 50th anniversary in 2010), as well as plays, concerts and films throughout the year. 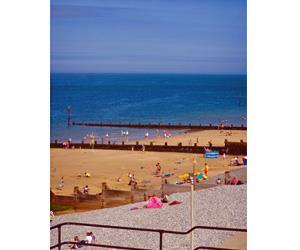 The theatre also hosts art exhibitions and galleries for all tastes nestle between Sheringham's independent traders in the warren of streets that unravel towards the seafront. The railway still serves Sheringham, with the Bittern Line connecting to mainline services through Norwich, while the famous North Norfolk Railway leaves form the centre of town offering steam train trips on the heritage Poppy Line across a scenic coastal and heathland route to Holt. At is heart, Sheringham's fishing heritage is very much in evidence, celebrated (along with four of the town's lifeboats - unique collection) at Sheringham Museum, which reopened in 2010 in new seafront premises. Sheringham is also host to the Potty Festival each year, attended by Morris dancers from across the country who fill the town's alleys and yards with different types of folk dance. The village of Upper Sheringham lies a few miles inland amongst the undulating countryside, flanked by the National Trust-owned Sheringham Park which bursts into a sea of rhododendrons each spring. Miles of well-signed footpaths around these two villages (including the Norfolk Coast Path which winds up and over Beeston Bump, Sheringham's landmark high point, on its way through the Norfolk Coast Area of Outstanding Natural Beauty) make Sheringham an ideal base for walking, cycling and horse riding. Once a small fishing community boasting - at its height - 200 boats whose catches of crab and lobster fed the fishmarkets of London, Sheringham became a prime holiday destination at the end of the 19th century with the arrival of the railway. The Splash Leisure and Fitness Centre, whose tropical leisure pool boasts a wave machine and water slide, offers all-weather family swimming.